As the famous Hindu leader, Mahatma Gandi said, "A small body of determined spirits, fired by an unquenchable faith in their mission, can alter the course of history." You could apply this quote to the founding of St. Therese Parish in 1924 by the Irish Province of the Discalced Carmelite Order. On January 19, 1922, the Definitor General of the Discalced Carmelite Order approved a petition from the Irish Province to explore the possibility of making a foundation in the United States. And so, in October 1923, two Carmelite Friars from the Dublin community, Fr. Bernard Gorman and Fr. Cyril Ryan, set out for the U.S. to find a suitable site. They began in New York and moved westward. After having visited many sites without success, they traveled to what was at the time the “Diocese of Los Angeles and San Diego” to meet with its Bishop, John J. Cantwell, himself a native of Ireland. To their dismay, Bishop Cantwell was less than enthusiastic about a new foundation. However, Msgr. John Cawley, the Vicar General, stepped in as an advocate for the Carmelites and convinced Bishop Cantwell to give it his approval. The Friars, pleased with the success of their mission, returned to Ireland to begin preparations for the new parish. The first Irish Friars chosen to establish the new parish were Fr. Malachy Cranfield, Fr. Simon Hayes, and Fr. Andrew Kenny. Fr. Ignatius McGrath, the Irish Provincial at that time, decided to make the trip with them to help start the new house and to assume charge of the parish. They sailed from Ireland on November 25, 1924, via the Leviathan, reaching Los Angeles on December 10, 1924. On December 15, Fathers Ignatius, Malachy, and Simon met with Bishop Cantwell, at which time he let them know that his intention was to name the new parish “St. John of the Cross.” However, the Carmelite Friars convinced him to name it after Blessed Therese of the Child Jesus, who at that time had only been deceased for twenty-seven years and who, while beatified, had not yet been officially canonized. Mother Baptista graciously opened their chapel to the Friars as a temporary parish church, until the Friars could build their own. On December 21, 1924, Fr. Ignatius wrote, “There being a few of our prospective parishioners present, I announced that the formal opening of St. Therese Parish would take place on Christmas Day by the celebration of the first Parish Mass at the Cloistered Nuns’ Chapel.” After living in temporary situations up until that time, on January 26, 1925, the Friars purchased a house at 515 Vega Street for $37,000. This large country-style house, built by Seth Champion in 1899, was to serve as the residence of the Carmelite Friars. The need of a church seemed more urgent every day. The nuns of the Cloister never murmured at the inconvenience of sharing their chapel: they only assured the Friars that they were praying fervently that soon it would be possible to build the needed church. Donations began to come in from all parts of the country. At the same time, the Friars recognized the need of a school (“No school, no parish church” became an axiom). In February 1926, Fr. Malachy was authorized to make plans to have a church-school combination building erected, and an architect, Ross Montgomery, was hired. The groundbreaking took place on June 1, 1926, and the church was dedicated on November 7 with a Mass celebrated by Bishop Cantwell. It was completed at a cost of $69,000 (the Irish Province had sent $82,000 for the new church and for the day-to-day expenses of the Friars. In the 1940’s, the money was sent back to the Irish Province in installments to be used for seminarians). The school was on the ground floor, and the church, on the upper. In its first year, beginning September 1926, the school enrollment was fifty-three children. By 1927, because many more people had relocated to Alhambra to take advantage of the new school, the enrollment had grown to 185, with two grades per class. The Dominican Sisters were in charge of the School until 1930, when they were asked by the Archbishop to take another school in Anaheim. It was the responsibility of Fr. Gerard Houlihan, the pastor appointee in December 1927, to find a new order of Sisters. After an extensive search, the Sisters of St. Mary of the Woods in Indiana (Sisters of Providence) consented to staff the school, which they did up until the 1980’s, when it became solely staffed by lay persons. On October 11, 1928, right around the time that Fr. Malachy returned to Ireland, two more Carmelite Friars, Fr. Benignus Dowling and Bro. John O’Neill, arrived from there. Bro. John is the Carmelite Friar who spent more years at St. Therese than any other—forty-three! During these years, he immersed himself in the life and work of the parish, always thinking up new ideas and better ways to be of service. His engaging simplicity and boyish enthusiasm, as well as the fulfillment he found as a Carmelite, were his most obvious traits. He died of cancer at age 71 on September 9, 1971. In June of 1933, Fr. Gerard Houlihan was appointed Prior of the Irish Novitiate House and returned to Ireland, at which time Fr. Andrew had his turn as Pastor. Four months later, in October 1933, Fr. Enda Somers (who, in 1950, was the first of the Irish Carmelites to die in California) and Bro. Aidan Coffey arrived from Ireland. Following Fr. Andrew, Fr. Patrick Collins served as Pastor beginning in 1939. He had originally come to Alhambra while still a seminarian and was ordained at St. Vibiana’s Cathedral. Fr. Patrick began fundraising to build a new church but, with the U.S. entering World War II, those efforts were curtailed. Fr. Martin Lydon, who arrived from Ireland in 1943, was Pastor from 1945 to 1948. He is remembered as a tireless organizer, and was also involved in fundraising for a new church. During his term, a former Army Hospital Unit was moved here from Santa Ana and reconstructed to serve as the Parish Hall (by September 1950, it was converted into school classrooms and no longer exists). In March 1946, more new priests arrived here from Ireland: Fr. Columban Fitzgerald, Fr. Ignatius McDonnell, Fr. Daniel Burke, and Fr. James Gilmartin. Fr. James was assigned as pastor from 1948 to 1954, and, the time being right, was the one who was finally able to do what those before him dreamed of doing: build a new church! He hired an architect, J. Earl Trudeau, to draw up the plans, and the church was completed by the end of 1950—at a cost of $225,000 (see the article on Mr. Trudeau following this article). The first Mass in the new church was celebrated by Fr. 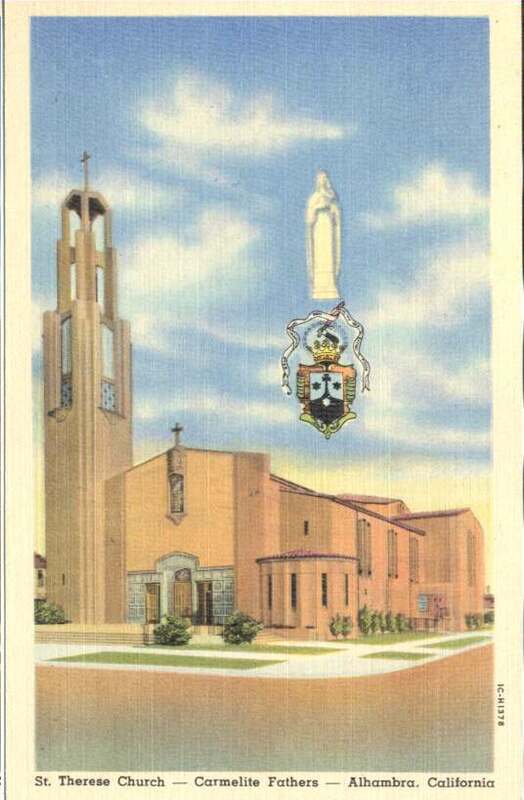 James on December 10, 1950, with 700 people in attendance; it was dedicated approximately a month later on January 14, 1951, by Cardinal McIntyre, then Archbishop of Los Angeles. The old church then became the Parish Hall; and the former Hall was transformed into two classrooms and a small meeting room. In 1954, Fr. Columban became Pastor and arranged for an official rectory to be built (1956-57), resulting in the house used as a rectory by the Carmelite Friars for the previous 32 years being razed. In 1959, also under the leadership of Fr. Columban, a new convent was built for the Sisters at 520 North Vega. Meanwhile, over the next few years, more Carmelite Friars arrived from Ireland, among the more well-known being Fr. Gerald Winters, Fr. John Lysaght, Fr. Celsus Wren, Fr. Dominic O’Callaghan, Fr. Patrick Deering, Fr. Jerome Lantry, Fr. Denis Conlon, Bro. Francis Fallon, Fr. Kevin McArdle, Fr. Ailbe Doolan, Fr. William Fenton, Fr. John Lysaght, Fr. Reginald McSweeny, Fr. Bonaventure Galvin, Bro. Francis Fallon, Fr. Edward Leahy, Fr. Joe Glynn, Fr. Michael Buckley, Fr. Matthew McKeogh, Fr. David Costello, and Fr. Patrick Sugrue—several of whom were assigned to St. Therese. Fr. Gerald Winters was assigned as Pastor in 1960. Due to increased school enrollment that year, Fr. Gerald oversaw the demolition of the old school and hall and the construction of the present school classrooms and Parish Hall, which were completed in 1963 (the hall is now officially known as the Fr. Gerald Winters’ Auditorium). From 1978 to 1984, Fr. Fenton served as pastor again—the only one to ever have been pastor for two terms. When Fr. Sugrue began at St. Therese in 1990, Fr. Fenton was transferred to San Jose to serve as the Superior of the Carmelite Novitiate until June of 1990. He counted the days until, in 1996, he was eventually transferred back to St. Therese as an Associate Pastor. From that time on, he served the parish continuously until his death from cancer on June 17, 2003, making it a total of twenty-five years of ministry at his “beloved St. Therese Parish.” To this day, memories of him are still strong in the minds of many of our parishioners. Fr. David Costello was Pastor from 1984 to 1990. During his term, Fr. David converted the baptistry (located on the west side of the back of the church) into a Parish Library, which was then run for many years by Parishioner Kay Fosselman (now deceased). Fr. David also is the pastor who instituted our Eucharistic Adoration Program in 1988 (see the article about the Chapel later in this directory), as well as programs like “Renew” and “Come Home” for Catholics who had left the Church. Fr. Stephen Watson served as Pastor from 1996 to 1999. (Fr. Steve was also known as the “Cowboy Priest” because, before entering the seminary, he had worked for many years as a ranch hand on a Wyoming ranch). Seventy-five years after the founding of the Parish, Fr. Steve was the first Pastor assigned at St. Therese who was not born in Ireland! Fr. Steve continued the fundraising to build the Parish Center, especially by way of seeking large pledges to avoid burdening the whole parish. In the Summer of 1999, he had just submitted the architectural plans to the City of Alhambra for approval when his term was cut short due to his being elected the new Carmelite Provincial. The pastor following Fr. Steve was Fr. Matthew Williams (1999-2005), who continued the fundraising. He was also responsible for taking bids and selecting the contractor. The groundbreaking for the new 10,000 square-foot, multi-use building took place on November 8, 1999, and the building began being used in October of 2000, although it wasn’t officially dedicated until November 5, 2000, by Bishop Gabino Zavala. During the term of the next pastor, Fr. Jan Lundberg (2005-2011), the debt for the building was paid off in full. In October 2011, our current pastor, Fr. Philip Sullivan, arranged for the Friars to move out of the Rectory-Office building into the former convent on Vega—which had been vacant for several months since the last tenants had moved out. The move allowed the Friars some much-needed privacy—and the parish, much-needed space. The priests’ living room and their library have been converted into conference rooms; the dining room, breakfast nook, and Fr. Jerome’s former downstairs bedroom, into a vestibule, sacristy, and Adoration Chapel; the backyard, into a public courtyard and a shrine to Our Lady of Guadalupe; and the upstairs bedrooms, into either offices or meeting rooms. In addition, we have celebrated three jubilees: our Silver Jubilee (25th) in 1949; our Golden Jubilee (50th) in 1974; and our Diamond Jubilee (75th) in 1999. The 50th celebration included a Parish family gathering in the Hall, where stories and anecdotes were shared about the parish’s past. We look forward to the celebrations for our 100th Anniversary in 2024! We hope that our Parish will continue to grow and thrive, and that new generations of Carmelite priests, brothers, nuns, and sisters will be drawn, through the intercession of St. Therese, from this, her own Parish. Let us continue the efforts of our forebears, draw strength from our Lord, and continue to make history for the next 90 years! In 1923, two Carmelite Priests from Ireland, Fr. Bernard and Fr. Cyril, were delegated to come to America and open a new foundation for the Carmelite Apostolate. Due to the request of the Prioress of the Cloistered Carmelite Nuns in Alhambra, the Archbishop decided to give the Fathers a parish on the east side of Alhambra–making it possible for the Fathers to become chaplains to the Nuns. 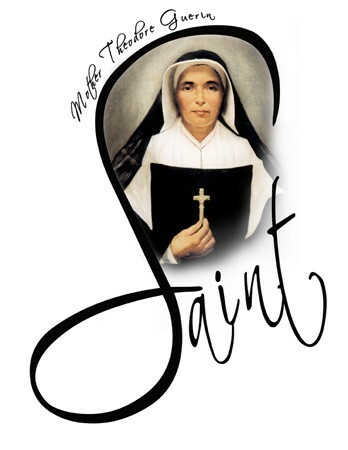 His Excellency thought of naming the parish in honor of the great Spanish Mystic and Carmelite, St. John of the Cross; but upon learning that the Carmelite Fathers wished to have it named after the recently-beatified French Carmelite Nun, St. Therese of the Child Jesus, he kindly consented. Fr. Malachy Cranfield (1) arrived in Alhambra on December 13, 1924, to become the first pastor. The Parish was officially founded on December 25, 1924, and dedicated to Blessed Therese of the Child Jesus, one of the first Parish in the world so designated. The Chapel of the Carmelite Sisters, 215 East Alhambra Road, served as the Parish Church until the church-school combination building was erected at 515 North Vega Street in 1926. The first big event in the parish was the Solemn Novena in preparation for the canonization of St. Therese–she was declared a saint on May 7, 1925. In December 1927, Fr. Gerald Houlihan (2)became Pastor and directed the development of the Parish until 1933. The Dominican Sisters were in charge of the School until 1930, when they were asked by the Archbishop to take another school in Anaheim. After an extensive search for a new group of sisters, the Sisters of Providence of St. Mary of the Woods in Indiana consented to staff the school, which they did up until the 1980’s, when it became solely staffed by lay persons. In 1933, Fr. Andrew Kenny (3) became the Pastor followed by Fr. Patrick Collins (4) in 1939. His big ambition was to build a new church that would accommodate the growing needs of the Parish, but the war years--with their restrictions--prevented that. Fr. Martin Lyndon (5) became the Pastor in 1945, and he shared the ambition of the former Pastor to erect a new church. He worked to raise funds for this purpose and, in the meantime, acquired a Parish Hall. In 1949, Fr. James Gilmartin (6) became the Pastor; and it was under his jurisdiction that the architect, J. Earl Trudeau, drew up the plans for the present church, which was completed in 1950. The first Mass was celebrated in it on December 10, 1950; and it was dedicated on January 14, 1951, by Cardinal McIntyre, then Archbishop of Los Angeles. The old church then became the Parish Hall and the former Hall was transformed into two classrooms and a small meeting room. In 1954, Fr. Columban Fitzgerald (7) became Pastor. He arranged for the now-existing rectory to be built in 1956-1957. By doing so, the house that was used by the Carmelite Fathers as a rectory for 32 years (originally built in 1899 by Seth Champion) was razed. Also, in 1959 a new convent was built for the use of the Sisters of Providence at 520 North Vega. In 1960 Fr. Gerald Winters (8) was appointed Pastor. Due to an increased school enrollment, the old school and hall were demolished; and Fr. Gerald oversaw the construction of the present School and Parish Hall–completed in 1963 in time for the opening of the school year (the hall is now officially known as the Fr. Gerald Winters Auditoriuim).